The Galt and Preston Street Railway Company Limited was incorporated on November 12, 1890, under the Street Railway Act of the Province of Ontario. The Letters Patent to the company were dated the 20th day of November 1890. The Head Office of the Company was to be the Town of Galt, but the Town of Preston insisted the head office be located there before they would grant the railway permission to construct the line through that town. This marked the beginning of what was later known as the Canadian Pacific Electric Lines. The primary object of the company was the building of a street railway between the then Town of Galt, with a population of between 7 and 8,000 and the Village of Preston, a distance of 4 miles in a north-westerly direction and having around 2,000 inhabitants. It was recognized by the promoters that the revenue from a passenger service alone would not be sufficient to justify the investment and although the Village of Preston was at that time served by what was then known as the Great Western Railway, operating between Hamilton and Guelph via Harrisburg Junction, the service provided was in-frequent and therefore wholly inadequate in respect to the local passenger needs. The promoters, however, believed that the financial success of the street railway would be assured by combining passenger service with the handling of freight, both l.c.l. and carloads between the Canadian Pacific Railway at Galt and the Village of Preston. The securing of municipal franchises was proceeded with. The Town of Galt and the intervening Township Councils, (North Dumfries and South Waterloo) granted franchises for a term of 20 years from February 1891. Some delay was experienced in securing a satisfactory franchise from the Village of Preston due chiefly to opposition resulting from the merchants who feared loss of business to the larger merchants of Galt. This opposition was finally overcome and the franchise granted for a term of 20 years from the 26th day of March 1893. After some financial difficulties, construction got under way in the spring of 1894. Construction of a single track railway commenced on Concession Street, Galt, adjacent to the Great Western Station and continued along the centre of South and North Water Street to the Dundas Road, the northerly town limits, and then along the northeasterly side of the highway between Galt and Preston, now Coronation Blvd. (highway 8), to the Village of Preston, then along the centre of King Street to and across the Speed River by a timber trestle to Main Street (a continuation of King Street and now part of that same street), terminating at the intersection of Main and Fountain Streets in the vicinity of what was then the Del Monte Hotel, later the Preston Springs, the Kress Hotel, and the Mineral Springs Bath House, all in the same neighbourhood and famous far and wide due to the alleged qualities of the mineral water. The total length of the main track was 4 � miles, standard gauge. In the construction of track the company purchased all materials; the work of grading and track laying was by contract. The steam power house and car barn of the company was located on the northerly side of King Street about the centre of the village. The steam equipment, including boilers and engines, were furnished by Goldie-McCulloch Company of Galt. The electrical equipment of the power house, as well as materials for the building of overhead lines was supplied and installed by Ahearn & Soper of Ottawa. They also supplied the two electrically operated cars, one seating 20, and the other 28 passengers (car nos. 22 and 23 resp.). Construction was practically completed about July 21st, but it was not until July 26, 1894, that a half-hourly passenger service was inaugurated. The handling of freight in carload lots was taken care of by a 17-ton Baldwin steam motor. This unit was completely enclosed by a cab to give it the appearance of a car and was said to be both noiseless and smokeless. In addition there was a small box car about 14 feet in length for handling l.c.l. freight between the Canadian Pacific shed at Galt and merchants and manufacturers at Preston. Supplementary Letters Patent, dated the 25th day of January 1895, changed the name to the Galt, Preston & Hespeler Street Railway Company Limited, and authorized the building and operation of an extension to the Village of Hespeler, 3.60 miles in a northerly direction. The extension to Hespeler was completed and placed in operation January 1896. Track construction was practically the same as that between Galt and Preston, but on a private right-of-way. 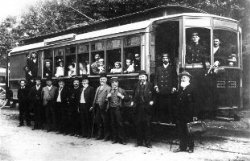 The electrification of the line, materials and labour, together with 100 k.w., 500-volt generator and two 18' single truck passenger cars, seating 24 passengers each, and one 12-ton single-truck, electrically operated freight motor capable of handling 1 to 3 carloads was supplied by the Canadian General Electric Company, Peterborough. The following year 2 open and 1 closed trailer cars were purchased and sidings were constructed into the industries on King Street, there being at the time a total of six; 3 furniture factories; 1 coal and wood yard; 1 stove and furnace foundry and one flour mill. At Hespeler the three large industries, comprising 2 textiles and a furniture factory were served by private sidings. In 1918, a portion of the original line between Preston and Hespeler was replaced by a new line constructed further away from the Speed River. Due to spring flooding each year, the rails would be covered by water at many points. The new line eliminated that problem being built on slightly higher ground. Approximately three kilometers of the original right-of-way is now part of the Mill Run Trail. The Galt, Preston & Hespeler Street Railway and the Preston & Berlin Street Railway were amalgamated, effective January 1, 1908, under the name Berlin, Waterloo, Wellesley & Lake Huron Railway Company and leased to the Canadian Pacific Railway for 99 years. In 1914, the name was changed to the Grand River Railway Company Limited.